This really is the World’s Best Oven Baked Meatball Recipe! I am sharing with you an authentic recipe for Italian style baked meatballs that are perfectly seasoned and tender. There are a few tricks and tips in this recipe that truly do make these the BEST meatballs ever! Serve up these Baked Meatballs with homemade tomato sauce or on meatball sub, for a delicious meal your whole family will love. Oh I know that post title may make you roll your eyes, because you thought your great aunt or grandma made the best meatballs or a local Italian joint. And yes, I am sure they are delicious, but you have not tried my recipe for oven baked meatballs. I take a simple classic meatball recipe and pump so much flavor into the mix that these Italian meatballs are anything but bland. They pack so much flavor into such a small bite, that your taste buds start doing a crazy little happy dance. They are stay perfectly tender on the inside and crisp on the outside. And in sticking to my healthy eating philosophy,I have found a perfect trick to making these meatballs healthier than any restaurant’s version or your Great Aunt Barb’s recipe. But they what they have lost in fat and preservatives, they sacrifice NOTHING in flavor. When these meatballs top spaghetti and are smothered in my homemade tomato sauce, all my cares melt away while I savor the perfect combination of comfort. But don’t limit yourself to only having these meatballs on just spaghetti. They are fabulous served as Meatballs Subs, or simmered into Italian Wedding Soup or tucked into pizza bread, as a marvelous little surprise. Let your imagination run wild and share with me your uses for these meatballs–I always prepare a huge batch so I always have some to pull from my freezer. The line up of ingredients are extensive, but they are simple and your will find most of it already in your pantry. The Meat: The base of your meatballs is truly up to you–you can use ground pork, ground veal, ground beef, ground Italian sausage or even ground turkey for meatballs. I personally use grass fed ground beef with a 15% fat content (85/15). As long as you stay between a fat content of 10-20% you can use any type of meat you like in this recipe for meatballs. I would not increase or decrease the fat any more than this though or you will either end up with a grease fire in your oven from too much fat or a dry meatball from not enough fat. Breadcrumbs: I use whatever bread I have leftover and grind it up in my blender or food processor to control the quality of ingredients. You can purchase store bought bread crumbs, but watch for added corn syrup and hydrogenated oils. It is easy to take leftover bread you have lying around and store in a large freezer bag in the freezer and at any time you can easily whip up homemade bread crumbs. If you need gluten free meatballs, I would suggest using an equal amount of gluten free oats in place of breadcrumbs. While I was gluten free, I did that quite often and never felt like the texture or flavor of the meatball suffered. Dried Herbs: I use lots of dried oregano and red pepper flakes to add serious flavor to these oven baked meatballs. Kosher Salt: I use a LOT of kosher salt in this recipe because I am using homemade plain, unseasoned bread crumbs and low sodium beef broth and you need salt to season food properly. If you are using regular beef broth or store bought bread crumbs or Italian sausage in your meatball mixture, decrease the salt to 1 teaspoon. Parsley: The only fresh herb I use is parsley–which is what 80 cents a bunch? A cheap but extremely worthwhile investment to bump up the flavor in these meatballs. Garlic: The fresh garlic gives these meatballs incredible flavor with a bit of spice. You can use jarred minced garlic or fresh minced garlic but I would not recommend using dried garlic. Parmesan Cheese: Be sure to use freshly grated cheese instead of pre-grated. There is NO comparison in the taste between fresh Parmesan and the stuff you find in a jar. Beef Broth: Beef broth is one of my secret ingredients in these meatballs. The beef broth gives a rich flavor to the meatballs and is my secret to steaming these meatballs while they bake–more on that in a minute. If you are opposed to beef, use vegetable or chicken stock in these meatballs and turkey or pork as your base. 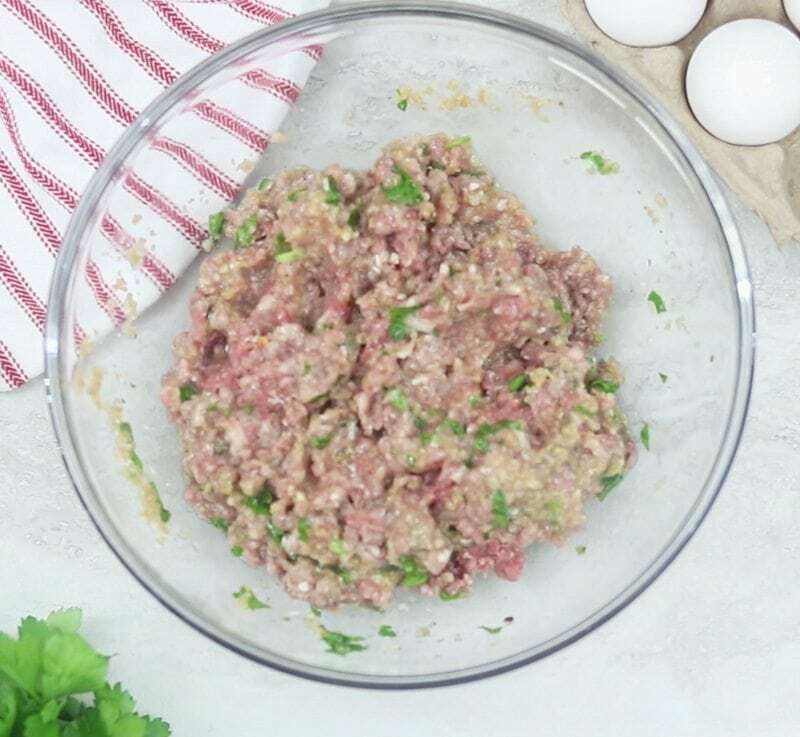 Egg: The egg binds the meatball together, if you are egg-free, omit the egg and add in a flax egg and work more delicately when shaping the meatballs. Egg-free meatballs will work, but are much more apt to fall apart if not carefully handled. Step One: Mix together all the ingredients except for the meat until well combined. Step Two: Add in the meat and gently mix–not with a spoon, with your hands. Your hands are your best tools for mixing meatballs!! The mixture will wash off your hands, I promise!! Step Three: Scoop the meatball mixture with a medium cookie scoop, rolling gently to shape if needed after scooping unto greased sheet pan with sides. By using a cookie scoop, it helps ensure all the meatballs are the same size which is key to delicious meatballs. Remember to handle the meatballs as little as possible–this will ensure tender meatballs. Step Four: Bake the Meatballs. Onto my secret tip for the BEST meatballs: Steam the meatballs in beef broth at a high temperature in the oven. To steam your meatballs while they bake in the oven is easy. Set your oven to 450 degrees. Pour beef broth (or another type of stock) around your meatballs and place in the oven. The broth will be absorbed into the meat and evaporated some in the oven, so that after a short baking time, the broth is gone and meatballs will have a chance to sear and get a crunchy exterior without being fried or covered in oil to bake. It is insane how well this works. Try it out–I promise you will be a believer. You can FREEZE these Italian meatballs to use for quick meals. I make a double or triple batch of oven meatballs and then once cooled, I place on cookie sheet and freeze until solid (about 30 minutes.) Transfer to a freezer safe bag for up to 3 months. To reheat frozen meatballs, either drop into simmering sauce for 20 minutes or reheat in an oven at 350 degrees for 20-25 minutes or until warmed through. Oven Baked Meatballs are delicious served on spaghetti or served up on a hoagie bun with melted provolone cheese for a Meatball Sub. 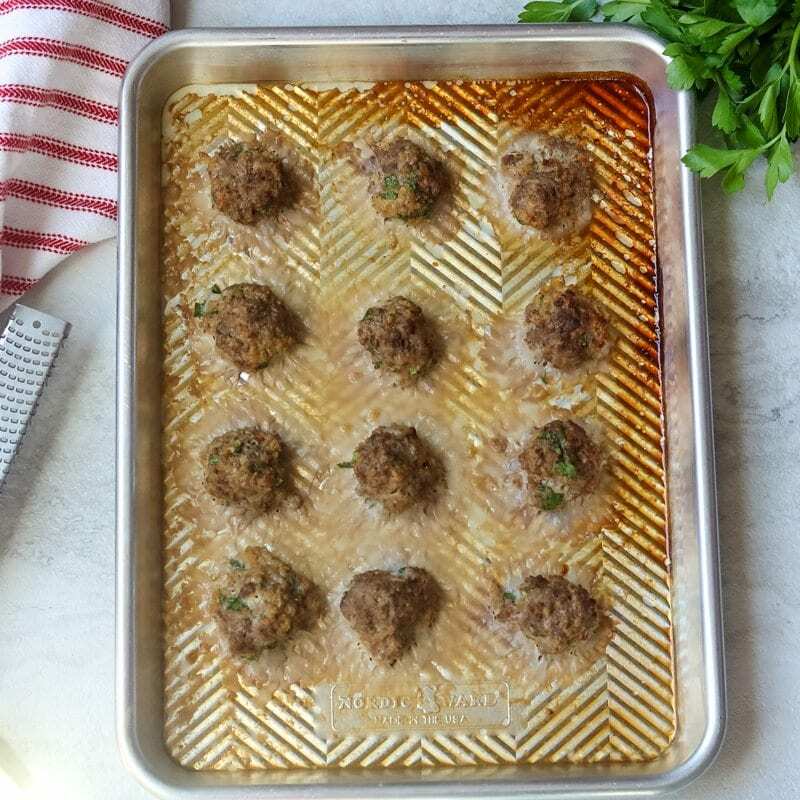 Remember to use a lined baking sheet for these meatballs so that you pour stock around them to steam as they cook. So whether you are looking for a comforting meal, something delicious to stock your freezer with that is versatile, or you just want to eat something delicious, this meatball recipe is for you. I can’t wait for you to try it and be pleased. This really is the World's Best Oven Baked Meatball Recipe! An authentic recipe for Italian style baked meatballs that are perfectly seasoned and tender. There are a few tricks and tips in this recipe that truly do make these the BEST meatballs ever! Combine the ingredients except for the meat well, using only 1/4 cup of the beef broth. Add the meat and just combine. Do not over mix, but be sure seasonings are well dispersed. Coat a baking sheet with rimmed edges with non stick spray and roll meatballs into 1 inch circles. Place meatballs onto baking sheet. Pour reserved beef broth around meatballs and bake at 450 for 25 minutes. Feel free to use any ground meat you like, just try to keep the fat percentage between 10 and 20%, for the best flavor and consistency. Meatballs are my JAM. This looks fab! What if you need to omit Milk? This looks like a wonderful meatlball recipe! I’ll be adding some extra garlic…. In my opinion, you can NEVER have to much garlic!! Looks good. Wonder if it works with ground deer meat? Of course, the more garlic, the better. I would add some ground pork to the venison to make it all stick to get together. Like making venison burgers or meatloaf. I use 3 parts venison to 1 part pork. Wow, these look great. Loved your idea of simmering the meatballs in the beef broth. Yum! That trick makes all the difference. Hope you give them a try. Can I skip the cheese and add more breadcrumbs? Hi JJ!! You can totally add in bit more breadcrumbs and leave out the cheese! I would add in 2 more tablespoons and up to 1/4 cup. Enjoy!!! You’re making me hungry! I love the idea of crispy meatballs with extra flavour from the broth, but you’ve kept them nice and simple, too. Simple but flavorful is ALWAYS the way to go! Great tips!! We never pan-fry meatballs. We always bake them and freeze them for later use. And we do like them garlicky!! By baking them they never fall apart and yet they are still tender and flavorful on the inside. You’ve made the perfect meatballs!! Thank you so much Marisa!! So glad you enjoyed these! These meatballs have so much flavor! Simmering in the beef broth is such a great idea! It really does add so much flavor! I love your tip for steaming the meatballs – so tender and juicy. I’ve found my go-to recipe for meatballs now. Thank you! YAY!!! So glad you enjoyed Joanie! These are so flavorful, I think they’d be PERFECT for meatball sliders! They would be perfect for sliders indeed April! I’m giving this recipe a try for the first time. I really like the beef broth twist. I actually used bone broth and rather than coating the sheet pans with cooking spray, I used a layer of rendered fat from a three pepper bacon I purchase from a Wagyu beef farm. Also I used a blend of parmesan, asagio and romano cheeses. Oh my goodness Douglas, with you Wagu Beef and fresh cheese and bacon, I want to come for dinner!! I hope you enjoyed and, yest that beef broth makes a world of difference in steaming the meatballs to keep them tender yet still crisping them up. So glad you enjoyed Sheri! They are my favorite meatballs ever. I love hearing that!!! So glad you enjoyed! Yowza, these meatballs are delicious! Easily the best I’ve ever tasted. We had meatball subs and everyone raved about them! Will never make them any other way again. Oh thank you so much for sharing your success Denise! I LOVE these meatballs so much myself, it makes my heart so happy to share the recipe with others. I am SO glad you enjoyed this recipe Eileen! I think you are right, these will be delicious over zoodles. Our favorite meatball recipe by far. Our compliments to you! This recipe has turned out great meatballs each time. Now we make a couple of batches and freeze for later. I did make these last night, and they were every bit as amazing and delicious as the recipe sounded! I froze half for later. Will definitely add this recipe to the “Good Grub Book” I will give to my kids for when they leave home. Thank you so much! Nothing makes me happier. Thanks for sharing! I am SO SO glad you enjoyed! And yes, for your case, leaving out the red pepper would be wise. Probably a stupid question but if I want to freeze some, do I do that once cooked? Thanks! No question is stupid! Yes, you would cook the meatballs first. Then let them cool fully and place on cookie sheet and freeze until solid (about 30 minutes.) Then transfer to a freezer safe bag for up to 3 months. To reheat frozen meatballs, either drop into simmering sauce for 20 minutes or reheat in an oven at 350 degrees for 20-25 minutes or until warmed through.
. I’m glad you asked! Made these last week with 1 lb of beef and 1 lb of ground italian sausage. My granddaughter says, you have to make these all the time instead of store bought. She even took them in thermos to school for lunch. Oh that just made my day Mike!! Thank you so much for sharing and I am so glad your family loved this recipe as we do. Can u bake them and then put them in the sauce? I like my meatballs cooked in the sauce so it gives the sauce flavor. I made these for a poker game on Saturday night. I used nearly four pounds of meat. I thought there would be tons left over. The guys kept going back for seconds and thirds and fourths. By one a.m. when we quit, there were nine meatballs left. My guests absolutely loved these meatballs. Thank you for the winning recipe which I, a not very proficient cook, was able to make (with some help from my wife)..
Hi Gary! I love that your friends enjoyed these meatballs so much! And I am also glad you and your wife were easily able to follow the recipe. I hope you and your friends enjoy them again soon! YUMMY!!! The only problem is trying to resist popping them in your mouth one after another! I didn’t have the exact ingredients but it didn’t matter – they came out soooo delicious!! I was doubling the recipe and used 3 # ground beef and 1# Jimmy Dean pork sausage. I only had dried parsley so I used 1/2 of what your recipe called for. Next time I will make my own bread crumbs. I had NO IDEA there was so much other stuff in “Plain Breadcrumbs”. Read your labels people. I used vegetable broth as I didn’t have beef. Also I had Parmesan / Regganio. These meatballs are amazing. I highly doubt that any of the 4 pounds I made will even make it to the freezer! Hi Pauli!! So glad you loved these meatballs so much! And yes–isn’t it crazy what bread crumbs have in them?! I love making my own at home as well. Question – can I bake in a glass lasagna pan or so I need to use a jelly roll pan? Hi Amy! As long as your glass pan is safe for a 450 degree oven, which varies by brand. I use a jelly roll pan for the rimmed edges so the beef stock will stay in the pan. So any oven safe casserole dish will work as well. Sooo good. I did half turkey, half grass fed beef and they had great flavor and consistency. I also did beef bone broth instead of regular beef broth. YAY Lauren! I am so glad you enjoyed. These are a family favorite here for sure. Loved the texture but way too much black pepper for our taste. It may have been off because I used ground turkey only (I also reduced the recipe by half as I had only 1 lb of ground turkey on hand). I think using beef or pork (or adding one to turkey) might help with the black pepper – if I use only turkey I plan to reduce the amount of pepper. Will definitely try this recipe again! Hi Andrea! I am sorry the pepper was strong–it is pretty heavy on seasonings. I will say turkey is more mild so that may have been part of the issue. Although, did you remember to half the pepper since you halved the meat? That could have been an issue as well. Do I need to divide ALL of the ingredients in half if I’m using only 1lb of beef? Just wondering if you can tell me how many this recipe makes? It says 12 servings but just wondering how many meatballs is a serving? Angelina, this makes my heart so happy! We adore these meatballs and I am so glad your family did as well! These meatballs were delicious!! They didn’t really get crispy with the amount of broth I used, but they were a hit nonetheless. Simple recipe and so yummy. Will definitely be making again! Thanks for sharing Abbey!! I am so glad you enjoyed. In the future if you would like crispier, you can cook a bit longer to evaporate liquid or broil, but it may dry the meatballs out a bit. Was looking for recipe for a tender not hard meatball. Made last night with just ground beef, came out great! Delicious! Will definitely make again! Thanks for sharing Jackie! We love this recipe so much and I am so glad your family enjoyed as well. Had many compliments from most of the family, including my husband. He said he’s always wanted to make meatballs just like those! Best meatballs I ever made! Will definitely be making again! Maureen, your husband’s compliments mean so much! YAY! And thank you for taking the time to share your review. I love the tip of using your kitchen aid mixer–it is great as long as you don’t overbeat your meat (which may make it tough) Sounds like you nailed it though 🙂 Take Care! I’ve made these 3 times, I have 4 tweens/teens!! I double the recipe and freeze into four meals. Spaghetti & meatball subs every busy Wednesday. I use 2 lbs hamburger & 2 lbs ground pork. WAHOO!!! That is how to do dinner my friend! Love that your family enjoys this so much. OMG!! I am so happy I discovered this recipe! I found it about a month ago and I’m making it for the 4th time today! I even made them for my daughter and son in law while I was visiting them in Vegas. They are the most amazing meatballs I have ever had! Thank you so much for sharing! Oh you are SO SO welcome! Thank you for sharing this with us Lisa! So glad you loved these meatballs. Just made these, came out juicy and flavorful. I didn’t have all ingredients and baby was sleeping, it was raining, full of excuses! I used half beef, half completely mild chorizo meat. It made up for not having enough garlic and herbs. Added fresh thyme and oregano. Crackers instead of bread, soaked in milk. Other than that followed the recipe and came out so good. Wish I made more. Hi Rena! I loved how you improvised! I totally understand not wanting to take the baby out in the rain! So glad you enjoyed. I have been making a very plain recipe for oven baked meatballs for years and I’m ready to up it a notch. I can usually make a large batch and use half for spaghetti and meatballs and half for sweet and sour meatballs. Would these be too heavy on the Italian side to use in a sweet and sour recipe? Hi Melissa! I have used this recipe for sweet and sour meatballs and love it. I would probably cut out the oregano–these meatballs will still be full of flavor without an overwhelming Italian taste. Enjoy! Delicious recipe! I’ve been in a dinner rut and I made this tonight! My kids loved it (2 and 8 year old). The only thing I did was decrease the red pepper flakes to half of what was called for…glad I did! I love a good spice but it may have been too much for my kiddos. Thank you again for sharing this truly amazing recipe! I know it will be in my family for generations! Oh I love to hear how much your family enjoyed this recipe! Thank you so much for sharing that! How long would you recommend cooking in spaghetti sauce? Hi Betty! I really recommend searing in oven first to seal in some of the flavors, and render off some of the fat. You bake for 10 minutes then finish cooking in the sauce for another 10-15 minutes. Or if you really want to cook from start to finish in sauce, cook meatballs in the sauce for 30 minutes but the meatballs won’t hold their shape as well. Hope those tips help. Great recipe, although next time I would like to make the meatballs about double the size, does anyone have any advice? Hi Erin! So glad you enjoyed! To make these double the size, increase baking time by 10 minutes. Check with internal thermometer to be sure it reaches 165 and you are good to go! Hi there. Was wondering how these meatballs would hold up in the crockpot covered in sauce? Thanks. Hi Michelle! Once the meatballs are browned in the oven, they will keep great in the slow cooker covered in sauce. Just heat through on the low setting, then leave on keep warm. Enjoy! 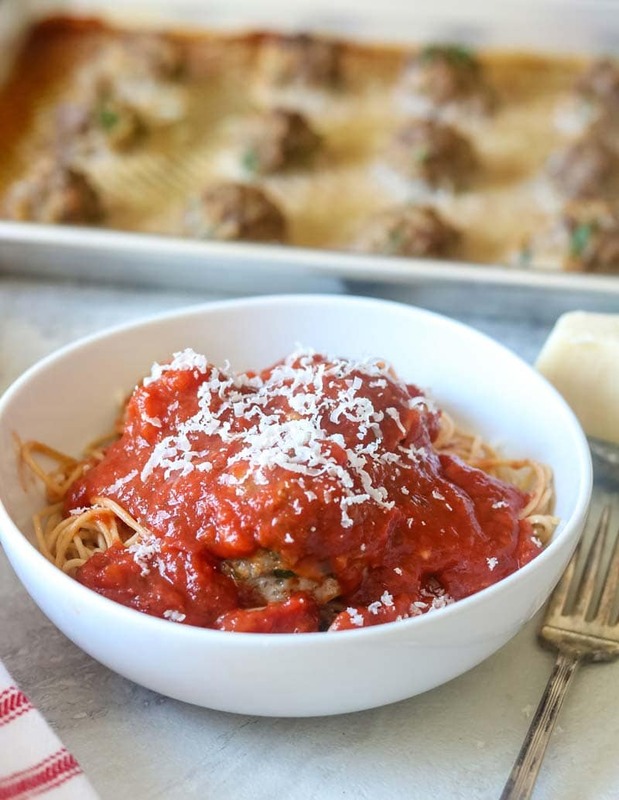 Made these meat balls with spaghetti… the family loved them!! They were so delicious! I used 3/4 part ground sausage to 1/4 ground chuck. Will be adding to my recipe book for year to come! YAY!!! So glad you enjoyed Mindy! Why no onion and green pepper? Hi Alison! I feel that onion and green pepper overwhelm the flavor and change the texture of these meatballs. I made these today however I didn’t know how many were in a serving. I looked at your pics and saw 12 meatballs thus I thought there were only 12 in a serving. Not sure if they will turn out now. Hi there! So the recipe states to make into 1 inch balls…which would make about 36 meatballs…or 3 per serving. You will just need to cook longer. I made these and it will be the only way 8 make meatballs from now on. The broth adds so much flavor. Great recipe. So glad you enjoyed Mike! My husband and I are on a low-carb diet after the New Year. I had some hamburger that I needed to use up and thought meatballs might be good. Your recipe was one of the first that popped up and the only one for which I had most of the ingredients.. Although I used cilantro instead of parsley, chicken broth instead of beef and store-bought bread crumbs, they turned out great! I love the moist inside and crunchy outside. My husband said they were even good cold for lunch the next day! Just bookmarked this recipe! I am so glad you enjoyed Terri! I hope you make these meatballs for years to come! I just made these for lunch, used a mix of ground beef, veal and pork.. used about 1/2 the pepper and they are delicious!!! Also made about 2” balls at 425 for 25 mins. A keeper indeed! No need for sauce! So glad you enjoyed Jodi!! Delicious!! Great meal for busy nights. Some are going in the freezer for next week. I didn’t have fresh parsley or garlic on hand so I substituted with 1/4 cup dried parsley and minced garlic from a jar – and left out the pepper completely. So tasty! Thanks for sharing this recipe! I am so so glad you enjoyed. And great substitutions, I love when people use what they have on hand to make recipes works for their families. Thank you so much for sharing! I love when a recipe of mine becomes a family staple 🙂 Have a great weekend. I am excited to try this recipe! Stupid question… do you add the beef broth to the actual meat mixture, or just in the pan for the steaming process? It says to add all ingredients to the except the meat in the first step. If you do add it to the meat is it the full cup? Thank you! I have no idea how I missed that! Thank you so much! 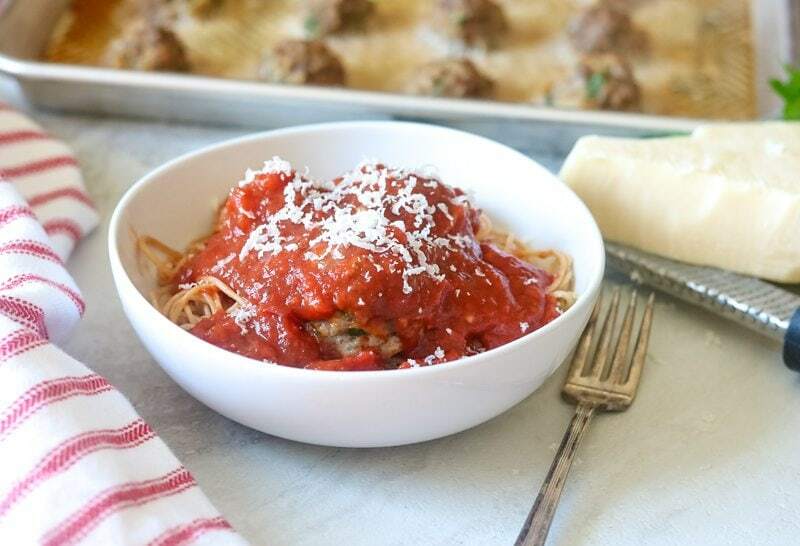 Thank you so much for sharing this recipe – I am a meatball snob and have been searching many years for the perfect meatball recipe. I can honestly say, my search is over! They are fabulous, hot, cold, sauced, plain. Haven’t frozen them yet (never any left). Thanks again! This makes me so happy Denise! Thank you for sharing with me that you enjoyed the recipe! YAY!! I am so glad you enjoyed Chris! We love this recipe ourselves, glad it is a winner in your book as well. They didn’t really get crispy with the amount of broth I used, but they were a hit nonetheless. Simple recipe and so yummy. Will definitely be making again! My oven element litterally broke when I made this recipe. But for some reason my broil element still worked. I broiled them 9 min a side. They turned out nice and crispy and absolutely delicious! Oh NO!!! I hate when appliances bite the dust. I am so glad you were able to salvage the recipe with the broiling function. And good luck fixing/replacing your oven! Holy cow! Literally, the hamburger meatballs I made tonight are flipping amazing! I made extras to try on a hoagie as a meatball melt. I tried them plain after cooking and totally mouth watering. Thank you for the recipe! I am so glad you enjoyed Brandon! And I know you won’t regret having extra meatballs for a meatball sub 🙂 Enjoy! These are amazingly perfect!!! I’ve made them with all combos of meats including all ground turkey OR beef with sausage and they are fantastic every time! I hold the red pepper since the kiddos don’t like spicy but thank you for my go to recipe! Love this!!! Ok. I’ve tried so many recipes on meatballs in the past but this one my most certainly is the winner in my cookbook. The meatballs are so incredibly tender and FULL of flavor. I used 1lb of ground Chuck beef, the 80/20 mix is perfect for this recipe in my opinion. Followed the recipe to the T except I used Parmigiano-Reggiano cheese and a bit more garlic. Felt zero guilt in tasting one, then another and another lol. They barely made it into the pasta sauce. Thank you for sharing this wonderful recipe. From your cookbook to mine. Gracias. Just made these. Some of the most amazing meatballs I’ve ever tasted and definitely THE BEST meatball I’ve ever made!! I am so glad to hear that you enjoyed Heather! I hope you find other recipes here you love just as much! Best meatballs I’ve ever made! I love hearing that Jess!! I hope you find more recipes here to enjoy! THANK YOU! I do think the beef broth must be the secret. My family loved these meatballs! It is so hard to make something we all agree on. That makes me so happy your family enjoyed Lisa! These meatballs are wonderful. I added more garlic and had an italian seasoning already pre-made by “Dion” so it was perfect. Nice and crispy – didn’t have beef broth, used vegetable and they still taste great. Will use beef broth next time. What a lovely go to recipe and the size is perfect for family and friends. Thank you so much!!!! You are so welcome. It makes my heart happy you enjoyed. Best meatballs ever! I now keep a batch in the freezer at all times. Thanks! I made these meatballs this week and I made slight changes to the amounts of ingredients based on what I have and what we like. Turned out a bit spicy, but very tasty. I ended up with 38 meatballs about 1-1/2 inch diameter. I baked them on 2 sheet pans using a full can of beef broth. My sheet pans are a bit warped, so 6 or 8 of the meatballs that didn’t sit in liquid burned a bit on the bottom. The 3rd batch, I used a glass pan (9″x9″) with the leftover liquid and turned the meatballs over halfway through…..worked much better. Next time I’ll use my 9″x13″ glass pan to ensure plenty of coverage. My honey liked them also. Thanks for the recipe. I am so glad you enjoyed! And great tip to use 9×13 pan! My whole family loved this especially my four year old son. So much better than a restaurant in so many ways. I love that it’s easy and quick enough so we can have a special dinner any night. I love hearing this Leanne! Thank you so much for taking the time to let me know! These were as good as advertised! My favorite ones I’ve ever eaten. I did one substitution…1 pound beef and 1 pound sausage because that’s what was in my fridge. It was so delicious!!!!! My kids and husband all said these were the best they had ever had, too. Thank you for this yumminess!!! Unbelievably good. I will use this recipe from now on. The meatballs were so moist and flavorful! I love hearing that. Thank you so much for taking the time to share Rita! I am trying these this weekend for my daughters first birthday party… could you put the in a slowvmcpoker afterwards with a different sauce? I was thinking honey garlic or bbq? Advice? Hi Sharon! I love using these meatballs as an appetizer. I will say they are heavy on the Italian Seasoning so if pairing with barbecue sauce, I would use half the amount of Parmesan and oregano. I also think these would be fabulous with a honey garlic sauce. Just cook as recipe states and then add so slow cooker with your sauce on low until just warmed through. Then keep the meatballs at “keep warm” to not overcook. Enjoy! And happy birthday to your daughter! What a precious thing to celebrate. I am always looking for a good meatball recipe. This one sounds delish. I like the idea of steaming the meatballs in broth. I have a question…it says to line the baking sheet when baking. What did you line your pan with? I never comment on recipes normally, but these are just AMAZING and the well deserve the title. It’s all in the broth! Moist yet crispy, every time! I cook these probably once a week now and cook extra for lunch the next day 😂💙 thank you for bringing these into my life…and stomach! Thank you so much Matthew for taking the time to comment! I am so glad you love these meatballs so much! I hope they continue to be a staple at your house. Love, love, loved them! They baked up so nice and tasted amazing. I used ground pork and I used way less salt but it was still a little too salty so I’ll cut the salt out next time. Thanks for the recipe! My husband travels and is a body builder/strong man (yes, somehow both, depending on the season). I am pretty sure I will have to quadruple this recipe, just for his lunch and dinner for one day! 😂 How long will these last if kept in a 2 gallon freezer bag, on ice, in a cooler? Hey Marcella–wow, your husband is a busy man! It is hard to say how long these will last because every cooler is different-some hold ice for days, some for hours. And it helps if you pack entirely full-but they will be safe as long as some ice remains in cooler. Hope that helps. OMG – the beef broth adds SUCH amazing flavor!!! It was my first time making meatballs – thank you so much!!! I made these meatballs, I couldn’t exactly go by the recipe since I didn’t have all the exact ingredients but kept it very similar. My family loved them, they started eating them and I told them to wait because I was making spaghetti to go with them. My son told me never make anything to go with them, they would eat the meatballs alone. Big success! Oh I am so happy to hear how much you loved these meatballs Lynn. Thank you for taking the time to share your review. I just made these meatballs for dinner, and yes, they are the BEST I ever made. Thank you for your notes and suggestions, they helped a lot. They were very moist, and my family loved them. I used all ground beef, and baked them on a foil lined sheet pan w/ the beef broth. I lowered the temp. To 400, for 25 min., then dropped them into the sauce for 1 hour. I LOVE hearing that you enjoyed these meatballs Anne! Thanks for taking the time to leave a review.